We know it's been a while since we've blogged, we've been busy designing beautiful homes like this one! Trillium Architects Stonecrest House is The Winner of the 2016 CTGBC Residential Award of Merit! Trillium Architects wins CTGBC 2015 Green Building Award! 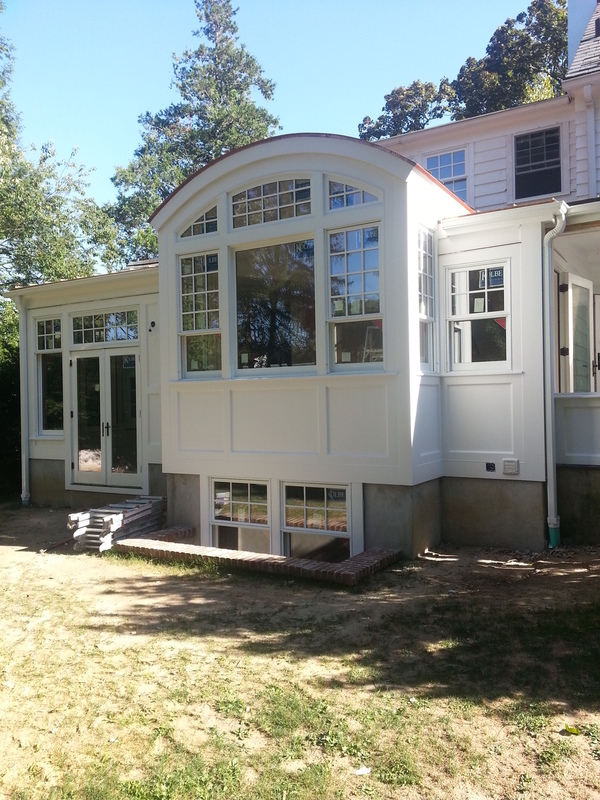 We have been working on two houses on the water in Stamford over the past year. One is a new 5,000 sf home. The other is an addition and renovation to an existing home. They are both in Dolphin Cove. A lovely residential enclave. These are some photos of the new house under construction. What amazing views! We love this house because of the room proportions- simple rectangles with tall ceilings, not too large and not too small. We also love that it will be a light filled white washed interior. It is great to have a client with sophisticated and simple taste! You can also see the radiant floor has been installed to go under the wide board wood floor to come. The house will be an indoor-outdoor, comfortable, airy and energy efficient refuge. This kitchen addition in Scardale has been in the works for about 2 years. After a good amount of care and watrering it is growing into a beautiful gem! Insulation has been installed in the house on the lake in Ridgefield. We are insulating with a combination of .8lb Open Cell Foam (walls) and 2lb Closed Cell Foam (under the first floor deck and in the cathedral ceiling/ roof.) Closed cell is much more dense, has better vapor barrier qualities and a higher R value but it more expensive and much harder to cut. We put it in places where we really need the vapor barrier. This house is now basically built like a thermos! The full envelope (walls, roof, floor) are all super insulated and it will take very little energy to heat and cool this house! 2 Mitsubishi, ducted mini-splits. One per floor.Will provide both cooling and heating. 1 high efficiency gas fireplace insert. This unit will be able to heat most of the house, certainly the 1st floor open floor plan which is approx. 1300 sf. This unit does not depend on electricity and will be placed in the old first floor fireplace. (The foundation and the old brick and stone chimney were the only things left form the original house). 1 direct vent gas fireplace unit in the second floor Master bedroom. 2nd floor is approx 800 sf. 1 ERV (Energy Recovery Ventilator)for whole house fresh air and ventilation. Important when you are making such a well sealed, insulated house. But don't forget you are still allowed to open all of your windows when you live in a well insulated house! Fans We are also installing fans- both room fans and bathroom fans which are low energy use ways to move air around and reduce the use of other heating adn cooling sources during the shoulder seasons. ...The second photo shows the foam after walls have been shaved. The shaving allows for the drywall to go in flat while still filling the wall cavity completely. You can also see here how the rim joists (the part above the ceiling along the outer walls of the house) are insulated. Yes, Foam DEFINITELY off gasses when it first goes in. You don't really want to be there when it is installed and you can still smell it strongly after the first few days and lightly there after for about 2 weeks. But then you really don't smell it anymore. So is it still offgasing? And if so how badly and how bad is it for you? Does it become inert and therefore basically innocuous? These are all really good questions and the answers are so far pretty debatable. However, one concern is fire. We had clients who had foamed their detached garage and finished it to make it an office a few years back. They had a small garbage can fire that really just scorched the drywall and was put out with little harm done. BUT the office forever after smelled horribly of the burnt foam and know one wanted to go in there anymore. The area of foam had to be fully removed to get rid of the smell. But foam works so well! and is Very easy to install. It really does have so many benefits. This is the north-west corner of the house. The old chimney has been repointed and a high efficiency gas insert will be installed in the fireplace opening inside. The stove will be enough to heat most of the house if the power goes out. On the second floor there will be another smaller gas direct vent unit in the master bedroom to take care of any lapses in heat on the second floor. On the roof deck we will install and outdoor fireplace at the chimney- purely for fun. There will be a flat deck and steel cable railings over the gently sloped roof that is on the roof deck now. The roof is sloped to drain. There is a large scupper in each far corner that will draw the water away from the house.